> Commercial & Industrial > Types of Commercial Roofing? > TPO v PVC? 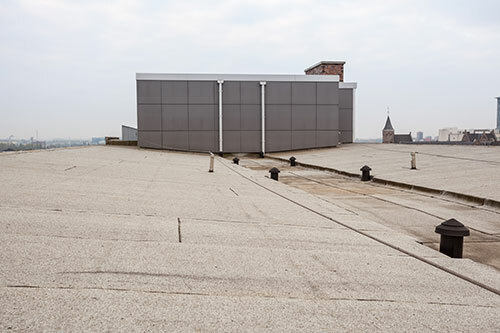 Are you looking to get started on a commercial or industrial roof replacement for your facility? New View Roofing is partnered with industry-leading roofing manufacturers, such as GAF, to bring you high-quality products and expert installation. We specialize in a variety of commercial roofing systems, including TPO and PVC single-ply roofing membranes. TPO (thermoplastic polyolefin) and PVC (polyvinyl chloride) are thermoplastic single-ply roofing membranes that have heat-welded seams. Both are considered “cool” roofing materials and can save you money on energy bills. They’re also installed using a similar process. The differences between the two materials lie in their chemical formulas. Both are designed to conform to the movement of the roof; however, PVC has better chemical resistance and tends to be more flexible than TPO. TPO tends to be the more affordable option of the two and offers better thermal expansion properties. Resistance to chemicals, fire & wind. New View Roofing has access to many superior commercial roofing products that are celebrated for their high quality and durability. If you’re trying to decide between a TPO or PVC single-ply roofing membrane for your commercial roof, our team of experts will help you make an informed decision. Call (469) 232-7220 or fill out our online contact form to schedule a roof replacement consultation with New View Roofing. We can provide a free inspection within 24 hours of receiving your request.